Yesterday I drew the Four of Wands. This card didn't reflect how I was feeling at all. I suppose it could be telling me to stop feeling sorry for myself and remember that I really am blessed. I have a beautiful family, a comfortable home, my health and good friends. 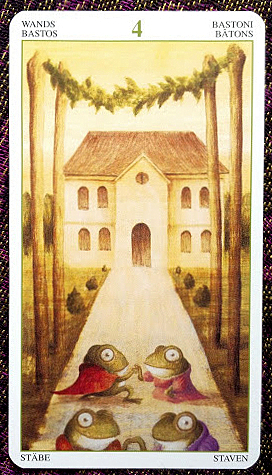 In fact, today's card is a very good representation of how I've been feeling. When I see this card, I always hear myself sighing, "Woe is me. 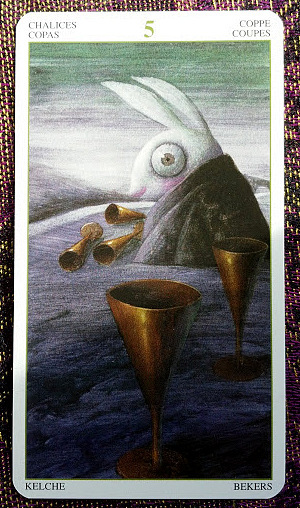 Poor, poor me," and yet, this card reminds me that while I'm focused on those three empty cups, I'm ignoring the two full cups in the foreground. Those two cups could very well be my salvation, filled with hope. Today I remembered the readings I've done for myself in the recent past. The ones where the Hanged Man showed up, letting me know that there would be a period of time where I would feel like I wasn't getting anywhere. "Hang in there, baby!" he seemed to be saying. So, I'm trying to be patient. I have no plan other than to keep treading water for as long as I can, to hang in there until something starts to improve. It's better than sinking.